It may feel like it is a nightmare trying to find competitively priced and flexible waste disposal services in leafy Horley. 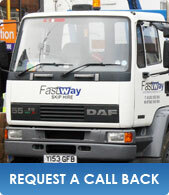 But fear not, Fastways is here with its Surrey wide experience and local knowledge – providing skip hire in Horley for years. Offering convenient, efficient reliable and reasonably priced skip hire Horley homes and businesses have been benefitting from for years, has given us the confidence to say that we know we will be able to meet your skip hire needs in Horley whatever the nature or scale of the job. We have a range of skip sizes and provide adequate supplies of bags to ensure that your waste is managed in the most appropriate way As we are a registered waste carrier – licensed by Surrey County Council – we can easily and efficiently provide skip hire services across Horley, from larger towns to smaller villages without any fuss or hassle.